The worship facility’s main sanctuary supplies seating for more than 2,800 attendees. How do you ensure such a large number will feel simultaneously immersed in the on-stage message? Jeff Cameron and Gadiel Marquez of Encore Broadcast Solutions, Inc. in Winter Springs, Florida, helped Faith Assembly develop the solution. An all-encompassing 60’ wide by 20’ tall screen serves as the focal point in the sanctuary, illuminated by two sets of double-stacked 16,000 lumen TITAN Quad projectors from Digital Projection International (DPI). Remarkably efficient, the four-lamp TITAN Quads have become sought-after worship imaging solutions for their ability to run in either two-lamp or four-lamp mode, depending on the imaging needs at the time. More than 14 single-chip and 3-chip DPI projectors can be found throughout the Faith Assembly campuses. Cost effective E-Vision 6000 and M-Vision 400 projectors are used in the youth areas, classrooms, board rooms and cafeteria. Additionally, an on-site wedding chapel is equipped to present a couple’s custom video content during marraige ceremonies, courtesy of an M-Vision projector. 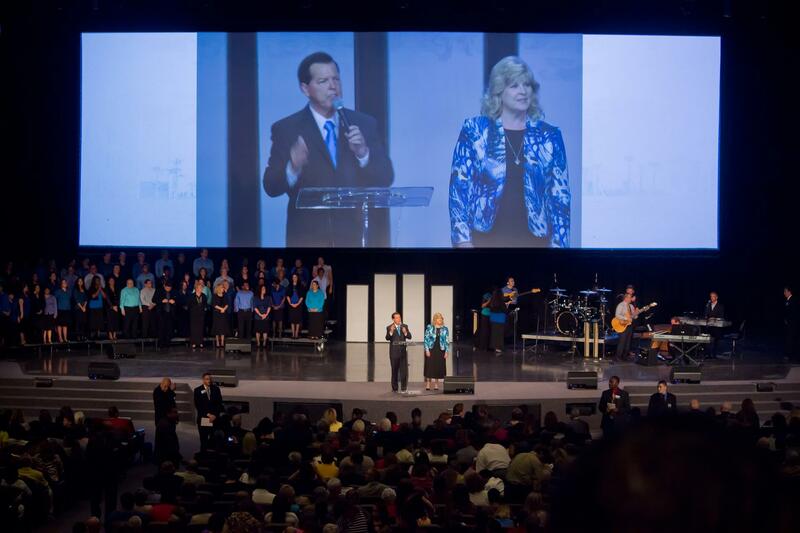 A second Faith Assembly campus that serves congregation members on the other side of town enlists two low-cost E-Vision WXGA 6000 displays for sermon messaging. “We love the TITAN Quads. Very easy to set up, very powerful and exceptionally reliable.” – Gadiel Marquez, chief system designer and chief engineer for Encore.